Be the first to share your favorite memory, photo or story of Delphine. This memorial page is dedicated for family, friends and future generations to celebrate the life of their loved one. 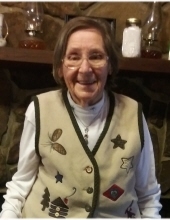 Delphine Jones Mailo, age 89, of Redbird Road, Williamsburg, Kentucky departed this life on Saturday, March 30, 2019 at her home. She was born on May 18, 1929 in Whitley County, Kentucky to Emerson Jones and Icie (Alsip) Jones. She was preceded in death by her parents, Emerson and Icie Jones; husband, Charles “Chuck” Mailo; and son, Russell Elliott. She was a member of Pleasant Hill Baptist Church for many years. She is survived by her children, Allen Elliott (Fonnie) of Walton, Kentucky, Virginia Williams (Gary) of Sebring, Florida, Paul Tamblin of Joplin, Missouri, Beth VanWinkle of Hilton, New York, daughter-in-law, June Elliott, and Debbie Tamblin of Williamsburg, Kentucky; 14 grandchildren; 19 great grandchildren; 8 great great grandchildren; five sisters, Edna Walker (Ed) of Walworth, New York, Georgia Rude (Larry) of Williamsburg, Kentucky, Nancy Morris (Don) of Williamsburg, Kentucky, Sue Lawson of Dayton, Ohio, and Darlene Watson of Corbin, Kentucky; three brothers, Bill Jones (Cathy) of Indiana, Leroy Jones (Miriam) of North Carolina, and Ralph Jones of Williamsburg, Kentucky; many nieces and nephews; and a host of other family and friends to mourn her passing. Visitation will be from 11:00 A.M. until the funeral hour on Wednesday, April 3, 2019 at the Pleasant Hill Baptist Church. The Funeral Service will be held at 1:00 P.M. Wednesday, April 3, 2019 at the Pleasant Hill Baptist Church with Rev. Albert Jones, Rev. Gary Lovitt, and Bro. David Jones officiating. Following the Service she will be laid to rest in the Pleasant Hill Baptist Church Cemetery. In Lieu of Flowers, Contributions may be made to the Pleasant Hill Baptist Church Cemetery Fund. To send flowers or a remembrance gift to the family of Delphine Jones Mailo, please visit our Tribute Store. "Email Address" would like to share the life celebration of Delphine Jones Mailo. Click on the "link" to go to share a favorite memory or leave a condolence message for the family.